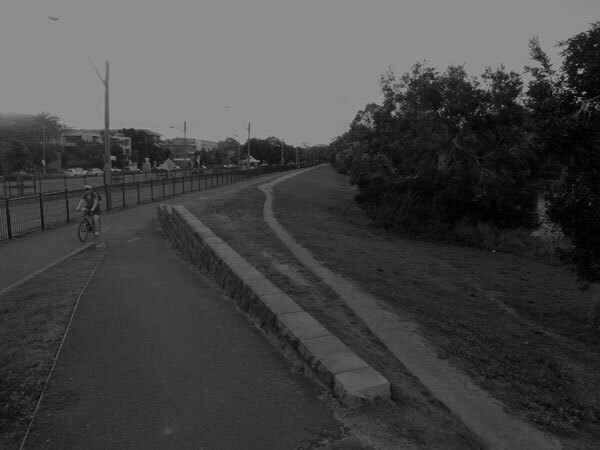 Eastern Sydney has three large, adjoining parks (Centennial, Moore and Queens) collectively known as Centennial Parklands. The original land in all three has been so made over since European occupation — through large scale earthworks and infrastructural works, plantings, buildings, roads and paths — that only a few artefacts have been found in its disturbed earth to connect the Park’s contemporary visitor with its Aboriginal past, and these few articles, though briefly noted in historical records, were lost long ago. The engraved images have long been destroyed by the construction of the present-day Darvall Street. The pigment images that were in the rockshelter/s in Queens Park were barely discernible during a daytime visit, much of the wall being covered by graffiti. The rockshelters in the cliffline at the eastern end of Queens Park all have sandstone floors. Any flat areas of land that may have existed in front of them, and may have contained stone artefacts, have been highly disturbed by the construction of an all-weather footpath. There is an abundance of broken glass associated with the shelters, but no stone artefacts were seen. No stone artefacts (as isolated finds or small scatters) were seen in other areas of the Parklands. There is nothing that warrants listing. Viewed from the satellite map on your phone, this flattened, screen version of Centennial Park is dominated by a roughly circular road system that is clearly emblematic of someone’s desire for order. Going in closer, you see that Grand Drive is split into four concentric rings, each allocated to a specific way for getting around. The outer ring is for cyclists and skaters, who travel clockwise around the circle. The next ring in towards the centre is for drivers; they go clockwise too. Next, we have one for walkers, joggers, pram pushers and little kids on scooters; they can go either way (and of course, anywhere, in any direction throughout the Park) but many stick to the ring route and most walk, jog, push or scoot clockwise. The innermost ring of Grand Drive is for horseriders; they appear to be allowed to go either way. Bounding the horses’ circuit of soft, hoof-churned dirt, as if to circumscribe the whole arrangement with a crisp white edge is a post-and-rail fence. As a system of circulation all of this works — but although many seem happy to limit their communing with nature to a circumferential workout (never stopping to smell the boronias) there are other, less limiting journeys to be had on other types of paths, that reveal traces of an ancient and unplanned place below the surface. Viewed once more onscreen, the grass and scrub beyond the ring route is covered with the scribbly, foot-trampled ribbons of bare earth that urban planners call desire paths, that are, in the capricious realm of human desires, the result of anything but planning. These are the tracks made by people taking the shortest, or most pleasant, or most attractive route: by shortcutting across the corner of a rectangular playing field, or taking the easiest way back to the car, or the closest way around a beautiful pond, or the shadiest way up to the shops in summer, or the springiest surface underfoot for a lunch hour jog, or the way the dog is inclined to head, or any way that, for any reason, no matter how vague, just feels right. Ultimately, when what began as a barely visible strip of bruised grass feels right enough times for passage by enough people, the faint bruise grows into a softly defined visual invitation to ‘Take this way’ and then finally, through regular use, a persisting mark on the Park’s living map. On this real map; the unflattened one; the living map made of earth and trees, water and grass, something surprised me about these tracks. Many of these worn patches in the grass and scrub reveal, not the expected dark brown, humus-rich loam of an established parkland, but an off white, fine grained sand identical to the off white sand five kilometres to the east on the coast — at Bondi, Tamarama and Bronte Beaches. Identical, because as I have since discovered from the Museum’s report, the land in the Park is an ancient extension of those nearby beaches in the form of remnant, wind-blown sand dunes from 30,000 to 40,000 years ago. 40,000 years ago this place was coastal. The twenty first century place looks different — not just because of shifting patterns in climate and coastline, or thousands of years of Indigenous firestick farming — but also, more recently, from an almost complete reordering of the landscape by Europeans, starting around 1827 when work began on a tunnel to take water into the city from Lachlan Swamps. Little of the original topography just before European occupation is left to be seen, except for those few bits that show through the surface as outcrops of sandstone, or parts of the original swamp, or some low hillocks that are what remains of the aeolian dunes, and the sandy undersurface exposed by those random paths through the grass and leaf litter. Although no section of the Park has escaped makeover since the early 1800s there are some parts that look less changed because they have the appearance of being less planned. The southwest corner has a different atmosphere to the rest of the Park. It feels like a place less thought through, more random, less formal, neglected, messy, shaggy. This is a patched place: ragged patches of banksia scrub, big white patches of exposed dune, irregular-shaped stands of irregular-shaped pines, a pond filled with surly, metre-long, grey-brown carp marauding for bits of bread thrown in by children for the ducks, and the Park’s best (most irregular, least official, scrappiest, shaggiest) desire paths. It’s late Sunday afternoon. I’m walking through the southwest corner — taking my usual point-and-click photos. Subject: desire paths. I’m trying not to look like I’m photographing people, and I don’t want to anyway, but I can’t resist observing them sideways from behind the camera. / A man sits on a bench among the pines at the top of one of the dunes. He’s playing a bamboo flute. The sound of shakuhachi music is difficult (for me with my West-tuned ear) to describe. Lonely? Melancholic? And beautiful. / Down the path, at the bottom of the flute player’s hill, on a large patch of sand next to a pond, a dozen or so smartly dressed people, wine glasses in hand, are toasting someone or something. The whole arrangement looks like a set, the central prop being a sort of minimalist teepee. Lit however, by a string of bright orange fairylights. I hope, for them, that they didn’t pay a venue fee (if a fee was required) to use this spot for their happy event. A small act of anarchy in a park where clockwise rules. / At the same time, five women (uni student age) are struggling along the path on the far side of the pond, toting dresses on hangers, nylon garment bags, camera cases, a couple of tripods and some lights. Local fashion and textile students I guess. Setting up a no-budget shoot for their grad show. / One lone dog walker. / And myself. / No one in lycra going around in circles. Just a handful of people on a Sunday afternoon having some kind of connection with place. More so, I think, than the type of connection one has looking over the top of a car’s steering wheel, or staring, as in a trance, at an endlessly approaching curve on a bitumen circuit. The report recommends further work to determine the full significance of known and potential sites—and it provokes in me, plenty of footloose speculation about potential finds. And about the nature of artefacts in general; about what types of artefacts there may be and what is and isn’t a legitimate artefact. How physical must it be? How complete? If something has been made in response to an artefact—a trace of the original or a work created because of it—does the overlay or the new work still somehow embody something of the original? Under the Park’s roads, cafes and toilet blocks, under the playing fields, in the sand alongside the ponds in the swampland and underneath those ponds, and below the patches of remnant banksia scrub, there may be evidence of one particularly large ‘artefact’ from pre-colonial times, still there in places where the earth remains undisturbed and free from landfill. Fragile remnants of an ancient system of circulation must still exist—the old Indigenous pathways—evident perhaps as almost imperceptible discolourations in the earth; still under the Park, and also still under Sydney’s web of roads, some of them having been built over this older network of paths that connected places for meeting, collecting food and hunting, trading, making camp, and making direct connections between the circumstances of daily life and the timeless Dreaming. Sections of this earlier map may still be under Oxford Street, which is said to trace an old path from pre-colonial times that followed the ridge running through Paddington and Woollahra, across the Park’s northern boundary to Bondi Beach. To think this! That the familiar route by car to Bondi may have been first set a thousand years ago. And also this: that in this concrete sense the old path has (with a subtle type of retaliative obstinacy, I like to think) survived. Perhaps the word ‘desire’ is off the mark here (with its intimation of get, get, get) to use in relation to these older paths. Both types of path—the old and the new—give rise to forms of attachment, and although harder to describe, I would say they engender forms of love. A traveller on one of the old paths would have felt deeply connected to places along the way through ritual and story. A traveller on a new path may be able to do the same, but in a limited manner. The new paths are for other things: to get an hour out on the bike, to escape from work or unemployment, to enjoy the solitude of a long run, to get a slimmer sexier body for the beach at Bondi or Tamarama, or get to point B because it’s not point A. This is not to discount the most elemental gift of the Park as it is today; it gives anyone with a love of the natural world a means of attachment—a way of feeling placed within the landscape—just by being there, in a Park devoid of the messages and agendas of the commercial landscape that exists out there on the other side of the gates. The old travellers, I imagine, would have felt placed within the pre-colonial terrain to the fullest degree. The new paths are travelled by a different type of nomad: more disconnected and placeless, and searching out forms of attachment in locations where a sense of self is relentlessly geared to a capacity to spend. The Park on the surface gives much, but once, the place below not only brought together the spiritual evidences of immediate location through story—the direct testimony of rocks, plants, animals, lakes, landforms—it also linked to other stories through a system of ancient human-made paths that crisscrossed and wove throughout the entire continent. From this thought, it is no great imaginative leap to conclude that once, the whole land, coast-to-coast, was one vast narrative—and stretching the definition here, of human-made objects—one vast artefact made of thousands of stories. This may be wishful imagining, but I sense that in the Park’s more neglected southwest corner the old presences attached to those paths are stronger: more present. Its atmosphere of planlessness seems to magnify this; to provide a small place in the middle of a big, highly ordered city to have a different understanding of landscape and liberate this desire, not just to move through it, but with a heightened sense of attachment, be it. Pre-colonial Aboriginal land and resource use in Centennial, Moore and Queens Parks — assessment of historical and archeological evidence for Centennial Parklands Conservation Management Plan. Photograph, GS: On a grassy embankment a desire path skirts Kensington Pond on Centennial Parkland’s southwestern boundary and runs alongside an official bikeway and pedestrian path, a dedicated busway, Alison Road, and the site of the—soon to be constructed—South East Light Rail line.